You know the Star Meter on IMDB? It’s the tiny little graphic I’ve circled in the picture above. Its most basic purpose is to quantify fame, influence and power in the entertainment industry, but if one really pissed off outlet is to be believed, the algorithm might be less unbiased science and more shady money-making scheme. Earlier this week, The Herald De Paris ran a scathing indictment of the Star Meter following what it refers to as a "year long investigation". In it, the outlet accuses IMDB and its parent company Amazon of dropping the rankings of industry professionals and then letting third party companies or possible shell corporations contact those very same professionals to offer a service that would fix the mistake. Sounds shady, right? Let’s get into specifics. 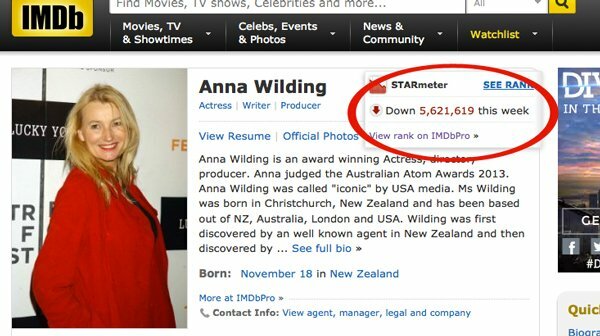 As alleged evidence of IMDB’s underhanded dealings, the outlet points to Anna Wilding. The writer/ producer has worked on a variety of projects over the years and is a contributing editor for The Herald De Paris. Her Star Meter ranking reportedly waffled back and forth between 5,000 and 90,000 for about fifteen years until she was contacted by a company called IMDBPromo. Representatives allegedly promised to improve her star rating if she paid. She did for one week and saw a moderate gain. After she allegedly stopped paying, her rating plummeted. How could someone’s Star Meter fall that far in a week? How is that logically possible? It’s not. So, that leaves us with three options. #1) She was ranked incorrectly the entire time and the error was corrected. #2) There’s some kind of glitch in the system. #3) Someone is manually altering the algorithm to reward and punish people who either pay or don’t pay. For an overwhelming majority of people, the Star Meter couldn’t matter less. No one is giving Kate Winslet roles based on whether she’s ranked in the top 250 or just the top 500. When it comes to hiring industry professionals, however, there are some casting agencies, low level producers and directors who use the Star Meter. When it comes to securing their livelihood, most people are willing to pay. Neither IMDB nor parent company Amazon has commented on this sketchiness; so, at this point, it’s entirely possible there’s not really anything more than an explainable abnormality going on. We're clearly not getting all of the facts here, and those facts very well could easily explain the incident or prove there is fire beneath this smoke. We just don't know yet. If someone speaks on the record, we will bring you their comments. Until then, look at the Star Meter with a little bit of caution.